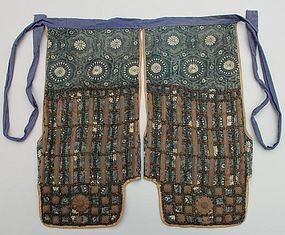 Antique haidate(Echu style), samurai's thigh guard, with metal pieces and chain on stencil dyed (katazome) cotton. The metalwork is older, probably from the 17th to 18th century. This was probably remade sometimes later in the Meiji period. Dimensions are 21 1/4” wide and 21 3/4" long with ties on both sides.